Taiwan-headquartered tech company Micro-Star International (MSI) has reportedly introduced a new portable computer, dubbed as the CR70, in Japan. According to the maker, this notebook will become commercially available on June 29 with a starting price of 79,800 JPY (about USD $996). The CR70’s data sheet indicates the laptop is based on the Intel HM76 Express Chipset and packs a third generation Intel Core i5-3210M central processing unit. This chip is ranked 45 in our CPU Benchmark List and offers two cores (4 threads) operating at a base frequency of 2.5GHz (up to 3.1GHz via Turbo Boost 2.0 Technology), 3MB of Level 3 cache, and Intel’s HD 4000 graphics card. Furthermore, the Ivy Bridge processor is complemented by a 17.3-inch non-glare widescreen panel with a native resolution of 1600-by-900 pixels. 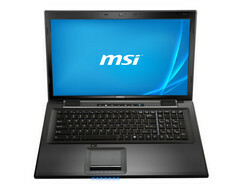 MSI claims the notebook comes loaded with 4GB of internal DDR3 RAM (up to 8GB), a 750GB mechanical hard drive and Blu-ray optical drive. In addition, the CR70 is outfitted with Wireless LAN 802.11 b/g/n and Bluetooth 4.0 radios. Other features reportedly include two USB 3.0 ports and two USB 2.0 ports, an HDMI output, D-Sub, 5-in-1 media card reader slot and a built-in HD web camera for video calls. MSI’s CR70 portable PC runs on a Windows 7 Home Premium (64 bit) operating system and weighs 2.8kg with the integrated 6-cell battery that presumably has an autonomy period of up to 5.6 hours on single charge.